So, obviously, our first priority once we hit Early Access was stability and game-breaking bugs. However, we’re now at the point where I have my weekends back again, and I have begun buying components to make another, brand-new console both for testing purposes and so I have one that isn’t a huge wooden thing designed for expos. This is something I’ll be doing on my own time, but in the process I’ve decided I’m going to, rather than use my own old hacked-together Arduino sketches, use Arduinos in Space. This also means I will be spending some time cleaning up, expanding and even overhauling parts of the Arduino-exposed interface. That being the case, especially once I begun, I was hoping people who’re doing console construction could send me some features they’d like. In the process of doing this, beyond giving a bit more options for console makers, I will also have the game automatically generate full and updated command lists, to be put in a text file with each build. So, those are the two main things I plan in the next while. Are there other features console-builders are after? I can’t guarantee they’ll be doable of course, but I’d love to know what people are currently finding the biggest limitations of the serial protocol. I’ve decided I’m going to, rather than use my own old hacked-together Arduino sketches, use Arduinos in Space. I will also have the game automatically generate full and updated command lists, to be put in a text file with each build. Great news! Right now I have a couple of awk scripts (showing my age here) to take the lists from the wiki and spit out header files full of constant structs that are bundled with my library. Would be good to have a definitive source, and high on my todo list would be providing an easy way to let users update their header files from the game data themselves, without having to wait for me to push a new release upon changes. I assume you’re already aware that the game is expecting 451\n from the client to begin handshaking, and this will be fixed soon. But it’s worth pointing out that the game responds with 452\r\n (note the unexpected \r). This is the only time I’ve noticed a carriage return pop up. I have two suggestions that haven’t already turned up in your mail box. I wonder if you would consider eliminating the separate sync phase and letting clients send CMD and NI* commands at any point after activating the connection. The natural extension of this would also be adding a way to remove active commands and requests. 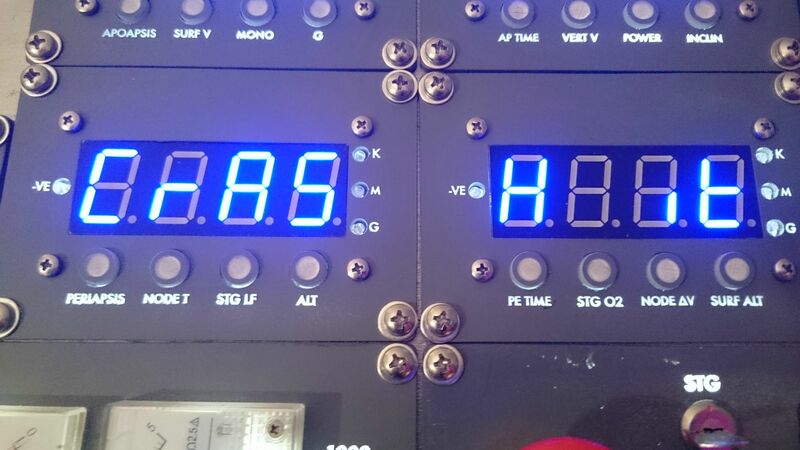 Each display has a few buttons underneath for various telemetry data. The user pushes one, the button illuminates to show it’s active, and the appropriate info is shown on the display. To implement a similar display in Objects currently, the console would have to request all four pieces of information while syncing, and the game would be constantly sending updates for all four channels, only to have the console immediately discard three. I would much prefer the console to be able to request and… uh… derequest? channels dynamically whenever a button is pushed. But I can envision other uses as well. A console could query how many tubes exist in the current vessel and only request data for tubes that exist. A console could reconfigure itself depending on which vessel class the player is flying. The protocol is wholly oriented around clients sending binary commands. Is there any value in adding other types? The only real use I have for this so far is letting a client give the autopilot a heading (either absolute or relative) in degrees and a target speed. And I’m not sure if that’s something you would even want to allow a client to do (I have concerns about how custom hardware can negatively impact game balance, and this feels like it may be too OP). But it might be something to consider. Anyway, love your work. Looking forward to future updates. All of those seem like pretty trivially easy things to add in! I began planning the layout of my small console (it’s about 35cm wide, with a sloped front). I am definitely going to need to add one or two more commands to make it work - including a ‘toggle selected tube’ button, I think, as for this console, to space space, it’ll be a few LEDs to indicate which tube is selected, plus a toggle switch. Once I’ve got the basics in place I’ll give it a look. If i do significantly change the protocol (removing the sync phase, etc) then I’ll likely want to leave that build in beta for a while and ensure anyone with consoles knows that an upcoming update will require code changes for their arduinos.